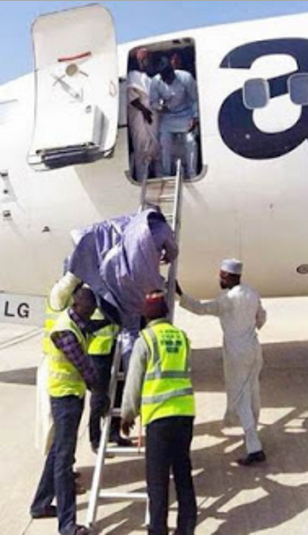 The Minister of State for Aviation, Senator Hadi Sirika yesterday directed an immediate investigation into the use of ladder by Aero Contractors Airlines to disembark passengers on its chartered flight at the Bauchi Airport on Saturday. This was disclosed yesterday by Mr James Odaudu, Deputy Director, Press and Public Affairs of the Ministry. According to him; “Several reports received by the Minister have indicated the airline used a ladder to disembark passengers from a Boeing 737 aircraft at the Bauchi airport on Saturday December 19th 2015. ‘’The act is inconsistent with Nigeria Civil Aviation Regulations, NCAR and International Civil Aviation Organization, ICAO, Standards and Recommended Practices, SARPS. “The investigation will determine the immediate and remote causes of the incident with a view to developing and implementing measures that will prevent a re-occurrence of the unsafe and unacceptable procedure that exposed passengers to high risk of serious injury. Odaudu added that the Minister assures the travelling public that the Ministry of Transportation in collaboration with Nigerian Civil Aviation Authority, NCAA, will ensure strict adherence to the Nigerian Civil Aviation Regulations as well as ICAO Standards and Recommended Practices by all operators. According to the Public Relations consultant of Aero, Mr Simon Tumba, the airline had to use the ladder because of ‘unserviceable equipment’ at the time of disembarking the passengers. He said this was rectified by the time the airline was boarding the passengers for their return flight.